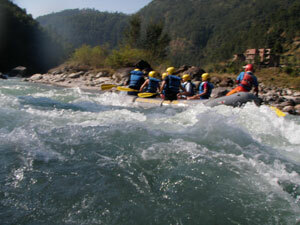 Accessibility and Location: Marshangdi River Rafting's the put in point nangdi for the Marsyangdi River is 6 hours west of Kathmandu by High Mountain Wave Trekking's private bus. Porters transport all the rafting equipment and other necessities for the trip. Transportation from Pokhara can also be arranged. The 65km of river action takes 3 days. Bus transportation is provided from the take-out point at Bimalnagar to either Kathmandu (4-5 hours) or Pokhara (3 hours).